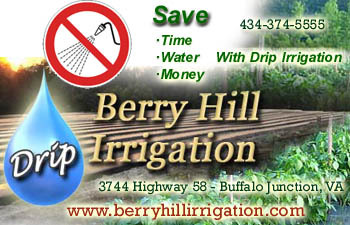 Do you want to increase your size of the garden, but don’t have much room? How about going up! Yes you can go vertical in a horizontal gardening world. Tomatoes, Cucumbers, beans, and melons are just a few plants that can adapt to good yield and growth in a vertical world. Using cages and trellising are two great ways to free up some extra space in the garden. Getting fruit and veggies off the ground can actually be a healthier way of producing beautiful produce with fewer disease issues. Anything that is higher up is good protection from snails and slugs as well. 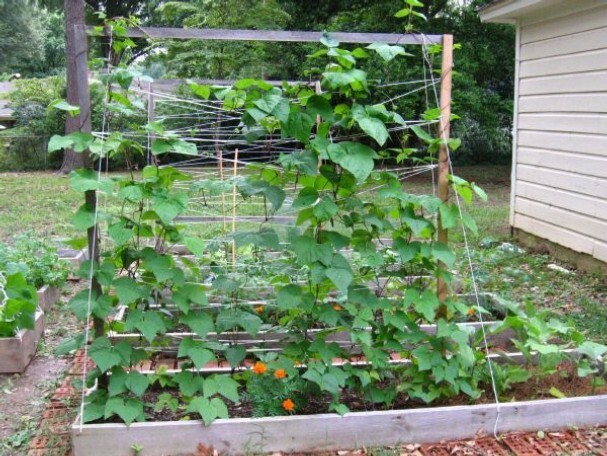 Trellises can be built using concrete reinforcement wire, pig wire or fencing wire to some posts. If you want to take the easy road you can find trellis netting at home & garden centers. Install your trellis on or before planting day to avoid injuring the plants' roots later on. If possible, build the trellis so that it's slightly slanted rather than completely vertical, with the top of the trellis angled to the east. This will allow the prevailing winds to push the vines onto the trellis, not away from it. The plants will also have an easier time climbing a slanted trellis. At times, you will have to guide the plants up the trellis, and sometimes you may have to tie the vines to it. Be careful not to cut into the plants as you tie them, but keep them tied tightly enough to provide support. Heavy fruit will need additional support as they start to size up. 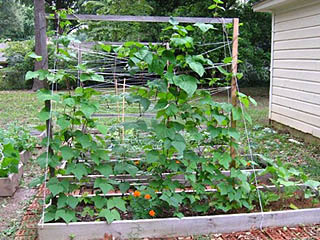 Use old stockings or bird netting to support large melons. If you have open soild on the back side of where the trellis is, you can always sow lettuce seed for a quick crop of greens for your salad. As I mentioned earlier, most vine crops can easily be grown on a trellises or in cages. Growing them this way will take up less space in the garden, and you'll have straighter and better quality fruit than when you produce them on the ground. Harvesting is also easier on the back. If you are a tried and true raised bed grower, you can attach trellises to the north and to the south end of your raised bed, training plants to grow on these structures. In between you’ll have an open area that will get plenty of morning through afternoon sunshine.